When I got the call from The Weather Channel to be on standby for live shots for Tropical Storm Bill, I immediately ran to the store to stock up on supplies. Having grown up around hurricanes all my life, I know that having an abundance of fresh water is key. Especially while out in the field working and basically living out of my Suburban. 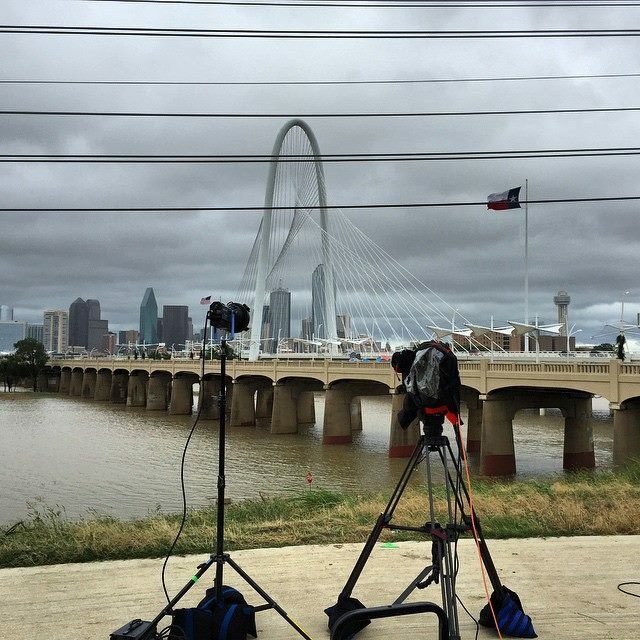 For the first two days of the storm, our camera crew was setup overlooking the rising waters of the Trinity River just South of downtown Dallas. 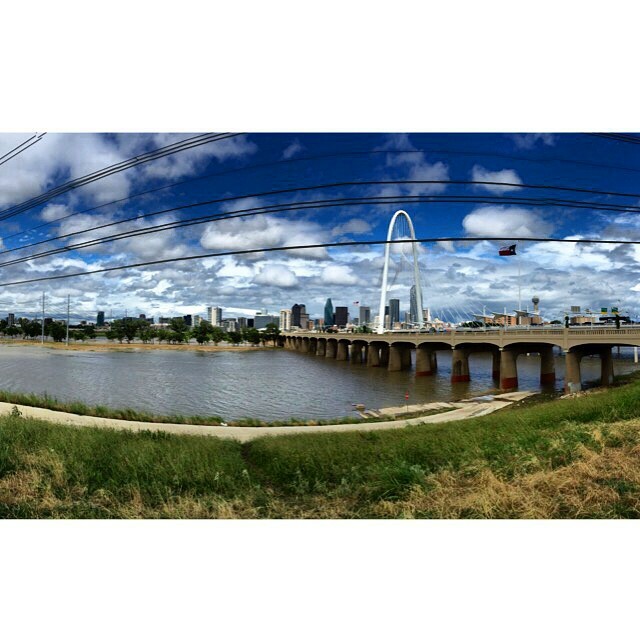 I have to say, I loved shooting at this location because it provided a great view of the Dallas skyline and the Margaret Hunt Hill Bridge. For the live shots, it was a no-brainer to put the skyline and river as the background. On the second day, we were posted up to where we were able to watch the Trinity River water level rise about 2 feet in 8 hours. 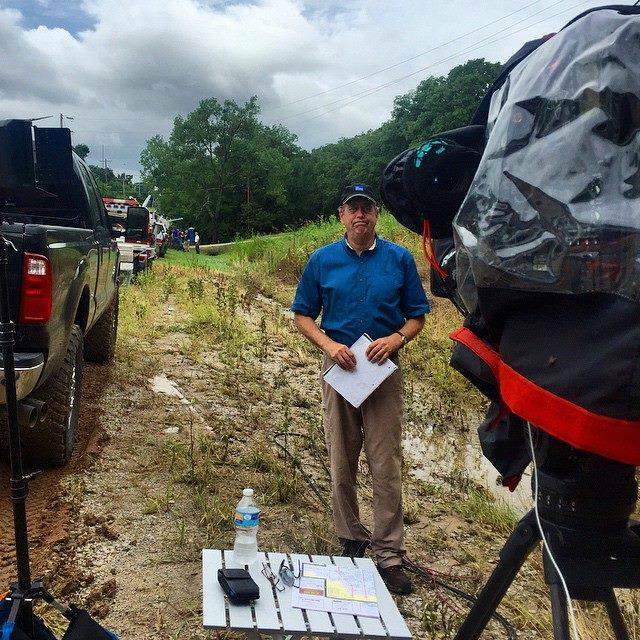 Shooting in the rain can be a challenge, however, it is just another day at the office for The Weather Channel. 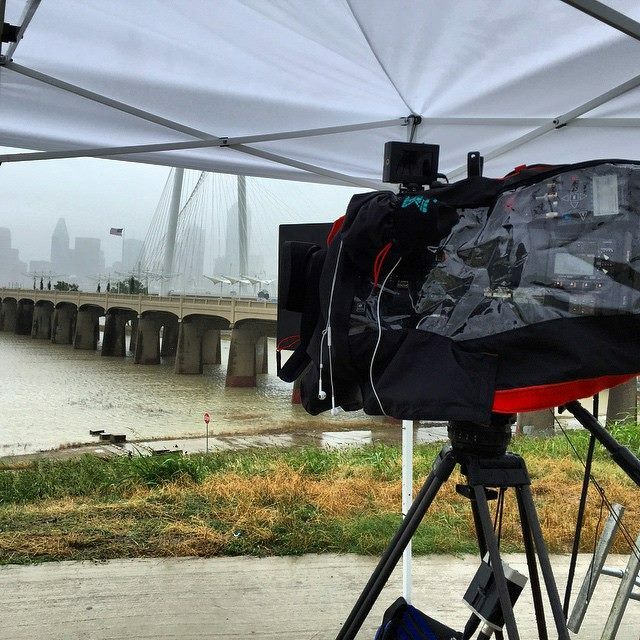 While shooting, we were all getting hit by gusts of wind up to 40mph and sideways rain all day. Needless to say, the rain gear never left my HDX-900. The rest of my gear was stored in either a trash bag or in pelican cases to keep dry. While we were in the elements, I decided to throw some light on my correspondent to match our white-out background from the rain. Now this is where my Bron Kobold all weather HMI’s came in handy! The third day for The Weather Channel was a bit different. I got the call early to drive up to Ardmore, Oklahoma, which is only a couple hours north of Dallas. With little information and an extremely vague address, my audio guy and I hit the road. When we arrived to our shoot location, we were immediately informed that we were covering a story about a 2-year-old boy who was swept out of his father’s arms while trying to cross flood waters the previous night. For me, this was a pretty easy day since it wasn’t raining where we were and the only obstacle we had to deal with was emergency personal getting in-and-out of the back road. I know this was a tough story for our correspondent to cover, but he handled it with true professionalism. The only view for the shot was of the “Road Closed” signage where the emergency personal had been staged earlier in the day. With the sun shining, I needed to bust out the big gun’s for their live shots. The 800W Bron Kobold HMI shined light on my correspondent and also my 6×6 Scrim Jim threw some diffusion over top of him. After we wrapped up our last live hit, we packed up our gear, loaded up the truck and headed home.